The name means ‘the lost stream’ and the wells are here still. Two centuries old, in three acres of peaceful meadow down a little lane, your charming gîte was once half cattle stall, half cottage – roofless when Alison and Francis took it on. Step into an interior of honey coloured stone and paint-washed floorboards, thick French linen draped at sweet windows and charming paint hues executed with perfection. Downstairs are the living areas and a cook’s dream of a kitchen with every mod con, upstairs are bedrooms with delicious rafters. For winter cosiness: heated floors and a toasty wood-burner in the beautiful Charentais fireplace. All feels fresh, rustic, spotless; an old armoire here, a chic basin there, country checks and elegant toile de Jouy, and art by the English owners. Sniff the scent of roses and lavender in the summer sun, cool off in the above-ground pool that sits next to a sturdy oak hangar. Stray beyond these delights and you come to the sands at La Rochelle and the exciting Futuroscope at Poitiers. Francis and Alison, a lovely couple, live nearby. Shops and restaurants are a short drive. Minimum stay: 7 nights, 14 nights in Jul & Aug.
Long winter lets (min 6 weeks) €295 per week. Extra bed/sofabed available £50 per person per week. A beautiful open plan cottage set in a very relaxed, tranquil location. Very conscientious owners who are so lovely! The new pool was also a very big hit with our girls! We had a perfect holiday! Thank you! Beautiful interior, lots of attention to detail. Loved the pool. Hosts welcoming and helpful with information. This was a beautiful relaxed location. The cottage was just as advertised... all very pleasing and easy going .... nothing to fault . Spacious and extremely well equipped ... but what made it even more special were the owners whose sheer niceness and genuine welcome topped it all... thank you ! Beautiful cottage and location. You simply won't find any better cottage to stay in - everything you need, clean, comfortable and quiet. The most noise we heard all week was the crickets (oh and our young children of course who really enjoyed the swimming pool - a real bonus which and bath like thanks to the solar heating. Thank you for a lovely stay. We'll be back! The location in this part of France is beautiful and very quiet. Close to lots of places to visit especially Angouleme and Poitier. The property is in a lovely spot and is superbly appointed. Everything you will need is there. The decor and quality of the rooms is second to none. In fact it's quite difficult to want to leave the gite to go out as its so relaxing. The pool, sun beds and table tennis are all great and we borrowed their bikes and there are some lovely rides all from the gite. Sauze Vaussais and Montjean both have boulangeries and the former has a supermarket and other shops. A wonderful rural retreat! So peaceful! Alison and Francis are so helpful and provide everything you could possibly need for a relaxing stress free holiday for all ages. Thank you! If you want peace, go here. The location is beautiful and all you need is included. Perfect to chill out and let the world go away for a while. The owners are truly interested in you enjoying your time there. 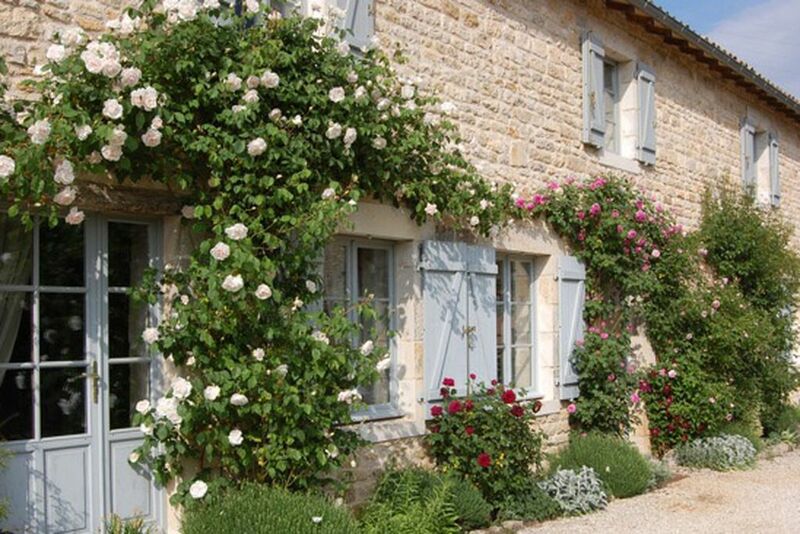 We have stayed in their other gites and have always been completely satisfied by their attention to detail. Nothing is too much trouble and I highly recommend a visit. Le Ruisseau Perdu is a real gem hidden away in the midst of the beautiful Charente country side. However not too far away from the coast for a day trip. Francis and Alison have a wonderful eye for interiors and have collected a enviable range of shabby chic French furniture for the house. The rooms were really comfortable with enough room for four adults and four children. We loved the personal touches of homemade Pineau, and jams. The children loved the table tennis and games. They would have loved the pool too, only it was a little early in the season. All in all we had a wonderful stay. Guests with little ones really appreciate our baby kit. This includes a cot & bedding, high chair, buggy, baby bath, paddling pool & is supplied free of charge. Bikes with child seats, kids trailer and safety helmets are also available. Fabulous countryside walks along limestone 'chemins blancs' bordering fields of sunflowers and sweet chestnut groves. Take one of our bikes out in the morning sunshine and bring back fresh bread and croissants from the local boulangerie. There's a wealth of local 'brocantes' and 'vide greniers' to forage for wonderful gems of French bric a brac. Why not join the locals for a long lunch at the traditional 'mechoui' (spit roast) and discuss the origins of your found treasures ! For a cosmopolitan hit, café culture and a spot of shopping therapy, there’s the beautiful Medieval towns of Cognac, Angoulême, Poitiers and the chic port of La Rochelle all within easy reach. Set in the heart of the 'Pays d'Art et d'Histoire' of the Pays Mellois. Peppered with delightful Romanesque churches which become the focus for 'Les Nuits Romanes' - a rich array of quality concerts and performances throughout the summer months. We’ll tell you about small producers of Cognac and ‘Pineau des Charentes’ but we’ll leave the delight of discovering hidden gems of the little known but exceedingly good wines of the Poitou-Charentes to you!